There are many variables and expenses involved in a wedding. The hall, food, decor, clothing, photo/video. But none of those variables have an impact on the atmosphere and feel of the wedding as much as the music does. The music at the wedding is what shapes the event. It modifies the general mood at the reception and dinner. It sets the tone at the Chuppah and brings out the emotions fitting for this momentous time in the life of the chosson, kallah, and their families. Finally, the music during the dancing is what truly brings out the simcha, the exhilaration. At the end of the day, having a great musician(s) at the wedding will mean that you and your guests will be talking about the music and dancing the whole way home and for years to come. Next time you're at a simcha, take notice: Not all bands and one-man-bands were created alike. At certain simchas, the music will start, and people will get up and dance because they are happy for the couple and want to fulfill the mitzvah of simchas chosson v'kallah. My objective while playing the dance sets is to give the guests no choice: My music should sweep you off your feet and keep you dancing until your face hurts from smiling, you are singing your heart out, and beads of perspiration are falling down your forehead. Growing up in Israel, my foremost musical influences were the legendary standard-setting chasunah bands who played in their ruach-filled halls. I must say, that's where I caught the bug. At every wedding I attended, I was that kid watching the band intently (not just the drummer!). As a musician, I have my finger on the pulse of Jewish music and follow the newest musical and technological trends, and I blend the old with the new. While performing, I retain a tight connection with the crowd. Whether during the dancing or during the dinner, I keep myself closely in-tune with the crowd to adjust the music according to the mood. ​With a combination of musicianship, repertoire, technology, and vocals, you can be sure that the music at your chasunah will make your special day as memorable as you can imagine. "Thank you for doing an amazing job at our daughter's wedding. You were so easy to work with and can really feel the joy you have for what you do when you sing. Your powerful voice contributed to the success of our simcha and provided a meaningful experience." -S.H. "Yehuda played at our wedding and it was fantastic. When we first met with Yehuda a few months beforehand to pick out the songs, we not only found him to very knowledgeable about a wide variety of melodies and dances, but he was also willing to learn our special requests. Yehuda is bright, engaging, friendly, and personable, and these qualities were a big part of the reason we picked him to do the music at our wedding. His musical skill and enthusiasm helped create an atmosphere that was fun for people of all ages; it was hard to believe that the sound and energy of an entire band was coming from one person! Everyone on the dance floor had a great time. Yehuda also did an amazing job at the chuppah and the reception before." -M.B. A bar mitzvah is a special event, and far more significant than a 13-year-old birthday party. It celebrates the beginning of a boy's transition into manhood, as well as the accomplishments strides the bar mitzvah boy has taken, together with his family. I enjoy playing at every bar mitzvah as if it were my first, and form a connection with both the family and the bar mitzvah boy's classmates and peers. 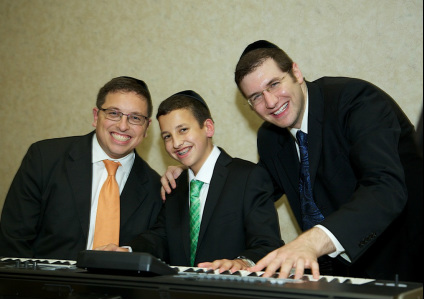 Furthermore, each bar mitzvah is special for the boy's friends and classmates as well. It is a true simcha, and should be approached with sensitivity. Unlike a chasunah, where the Chosson and Kallah's friends are mature adults, bar mitzvahs require additional attention and sensitivity. If you're looking for a out-of-this-world "leibedik" first-dance and a pumping and rocking 2nd dance, you've certainly come to the right place! Doing the dances, I take my cues from the crowd to keep the pace and the dynamic. In addition to playing and singing the music with my signature touch, I engage the crowd when appropriate to ensure the evening retains its special atmosphere. If time allows, I conduct a unique kumzitz. While the boys are in the circle, I consciously aim to engage all the boys as a group and impart the boys that part of becoming a man is learning teamwork, singing in one voice, and using such moments to connect with the Ribbono shel Olam. "I have never before seen my students dance this much, and with so much excitement, at a Bar Mitzvah! Maybe we should invite Yehuda to come to our class every day"
“Unbelievable. You mamesh made the bar mitzvah. I wish I had ten more bar mitzvahs so I could hire you ten more times. It was so great the way you let kids sing, while you did your thing. Continue your good work!” -F.K. "Yehuda was INCREDIBLE!!!!!!! There are not enough words to describe how amazing Yehuda was!!!!!! The music , the liveliness, the Energy he brought in the room transformed the Simcha!!!!!!!! Yehuda knew which songs to play, made sure everyone was included, got the boys on track when necessary- he is UNREAL!!!!" -S.H.